For the composer, see Juan José Castro. For the footballer, see Juan David Castro. For the bishop, see Juan Castro (bishop). Castro speaking with the media. Juan Gabriel Castro (born June 20, 1972) is a former Mexican Major League Baseball infielder. He played for the Los Angeles Dodgers, Cincinnati Reds, Minnesota Twins, Baltimore Orioles, and Philadelphia Phillies during his career. Castro batted and threw right-handed. He was known for his defensive ability during his career. He was primarily a backup. Castro was signed as an undrafted free agent by the Los Angeles Dodgers in 1991 and began his trek through the minor leagues with the Great Falls Dodgers in 1991. He followed that up with time spent with the Bakersfield Dodgers, San Antonio Missions and Albuquerque Dukes. He was selected to the Texas League All-Star Team while with San Antonio in 1994. Castro made his major league debut with the Los Angeles Dodgers on September 2, 1995 against the Montreal Expos as a defensive replacement at third base. He got his first at bat on September 11 and recorded his first career hit in his first career start, on the final day of the season, October 1, against the San Diego Padres. Playing for the Dodgers was especially meaningful for Castro, as he idolized fellow Mexican and former Dodgers pitching ace Fernando Valenzuela as a child. Castro played for the Dodgers through the 1999 season. His primary position was shortstop, but he also backed up at second base and third base. 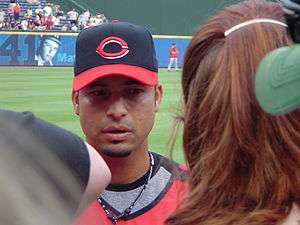 After seeing very little playing time during the 1999 season, Castro was traded by the Dodgers to the Cincinnati Reds for Kenny Lutz on April 1, 2000, just before the start of the season. He played with the Reds from 2000–04, mostly as a utility player. In 2005, Castro was signed by the Minnesota Twins as a backup to rookie shortstop Jason Bartlett. Bartlett struggled and Castro saw increased playing time. On June 15, 2006, Castro was traded back to the Cincinnati Reds for minor league outfielder Brandon Roberts. On April 21, 2008, he was designated for assignment by the Reds. On May 2, 2008, he became a free agent. After spending some time playing for the Colorado Rockies' Triple-A affiliate, the Colorado Springs Sky Sox, he was traded to the Baltimore Orioles on July 19, and was immediately added to the major league roster. Castro started more games at shortstop than any other player in 2008 for the Orioles. He became a free agent at the end of the season and on January 4, 2009, he signed a minor league contract with an invitation to spring training with his original team, the Los Angeles Dodgers. He spent the season as a backup infielder and then filed for free agency again. Castro agreed to a one-year deal with the Philadelphia Phillies on November 24. Castro temporarily replaced Jimmy Rollins at shortstop after Rollins suffered a right calf injury. Playing third base, Castro fielded the ground ball and threw to first, completing the 27th and final out of Roy Halladay's perfect game. Castro was released by the Phillies on July 17, 2010, and returned to the Dodgers on a minor-league contract on July 27, 2010. The Dodgers called him up to the Majors on August 11, 2010. He appeared in one game and was designated for assignment on August 21. The Dodgers had intended to recall him when rosters expanded in September, but he chose to remain home to attend to an ailing family member. He became a free agent after the season but re-signed with the Dodgers on a minor league contract that included an invitation to spring training. He was assigned to the AAA Albuquerque Isotopes. On May 13, 2011, he had his contract purchased by the Dodgers. After appearing in seven games, during which he was 4 for 14, he was again designated for assignment on June 6. He retired from baseball on July 10, 2011. Castro agreed to a new position as a special assistant to the General Manager with the Dodgers, with involvement in player development and talent evaluation. He was also a coach with the Mexico national baseball team in the 2013 World Baseball Classic. Castro was the Dodgers minor league infield coordinator in 2015. In 2016, he was added to the Dodgers major league staff in the newly created post of Quality Assurance Coach. ↑ Diamond Leung (2009-01-04). "Dodgers sign Castro, a possible backup to Furcal". pe.com. Retrieved 2009-01-05. ↑ Juan Castro back with Dodgers, ESPN, May 13, 2011. ↑ Nicholson-Smith, Ben. "Dodgers Designate Gibbons, Castro For Assignment". MLBTradeRumors.com. Retrieved 6 June 2011. ↑ Adams, Luke. "Juan Castro Retires". MLBTradeRumors.com. Retrieved 10 July 2011. ↑ Gurnick, Ken. "Castro retires, joins LA management team". Dodgers.com. Retrieved 10 July 2011. ↑ Weisman, Jon (December 17, 2015). "Dodgers name coaches for 2016". Dodgers.com. Retrieved December 17, 2015.